The clock tower in St. Mark’s Square is a fascinating and beautiful piece of Renaissance architecture, and impressive to me for its grandeur as well as its antiquity. 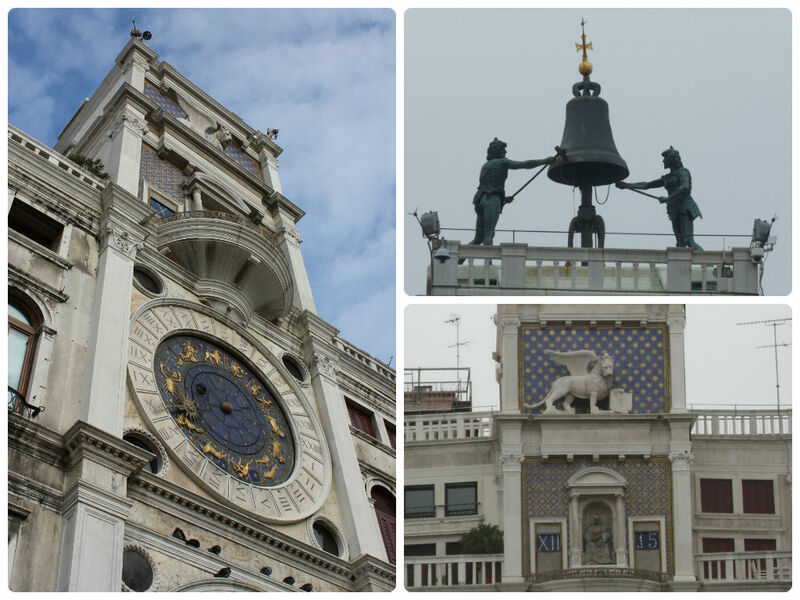 Facing the waters of St. Mark’s Basin, the richly enameled clock face is yet another symbol of the wealth and prestige that was Venice at the zenith of her glory days. Completed in 1499, the clock tower was originally freestanding. Four lateral bays were added in the early sixteenth century; the upper stories and balustrades more than a century later. The arched opening below the clock is the entrance to the Merceria—Venice’s primary thoroughfare—which runs from St. Mark’s Square to the Rialto Bridge, connecting the city’s religious center to its commercial district. A pair of colossal bronze figures standing atop the tower are known as “Moors” because of their dark color. The bell situated between the two is original and was cast at the Arsenal in 1497. The Moors strike the hours on the bell. The inscription on the tower reads “Horas non numero nisi serenas”—“I only count happy hours.” One level below the Moors and their bell is the winged lion of Venice with an open book. Below that is a semi-circular gallery with copper statues of the Virgin Mary and Jesus positioned between two large, blue panels showing the time—the hour on the left in Roman numerals, and the minutes (at five-minute intervals) on the right in Arabic numerals. The clock’s enameled face of blue and gold is fixed within a marble circle that is etched with Roman numerals for the twenty-four hours of the day. A golden hand with an image of the sun travels around the circle, indicating the hours of the day. I am amazed at the intricate workings of this centuries-old timepiece! Not only does it reflect the date and the hour, but also the position of the sun within the zodiac and the phases of the moon. We walked from our hotel to St. Mark’s Square on our first night in Venice. Despite the frigid temperatures (it was an unusually cold November), there were a number of people milling around. The lights shining through the mist from the Procuratie (buildings along the perimeter of the piazza) created a warm, hazy glow as we sipped steaming cups of coffee and cocoa purchased from the American Snack Bar—conveniently located at the edge of the square. There was a disproportionate number of vendors trying to hawk their (illegal) merchandise near the cathedral. The most common item was a small helicopter-type toy with neon lights that made a high-pitched whirring noise when tossed into the air. This they did repeatedly while attempting to cajole visitors into purchasing one. It was an annoyance, albeit a minor one. The following day we returned to St. Mark’s Square with our guide, Elisabetta. We toured the Basilica, but were not allowed to take photographs beyond the atrium. A group of tourists chose to ignore the “No Fotos” signs and were promptly dressed down by Elisabetta. It was quite amusing. I do not remember the specifics, but I know that we had to enter the cathedral at a certain time, and the lights were not on. I think the effect would have been more impressive had that not been the case. Even so, it is ornate and stunningly beautiful. The cathedral was packed with tourists and I have been told that it is the largest magnet for pickpockets in Venice. The most amazing element of the basilica’s décor (in my opinion) is the shimmering golden mosaics that date back to the medieval period. Almost a third of the mosaics survive in something close to their original form. These date from the 12th and 13th centuries and depict the Creation, stories of Abraham, Joseph, and Moses, the life of Christ, and other Biblical events. The Cotton Bible—the earliest illustrated Bible, which was pillaged from Constantinople—provided the designs for the exquisite mosaics. St. Mark’s Campanile (bell tower) is 323 feet tall and stands in a corner of St. Mark’s Square near the front of the basilica. It is actually a replica built in 1912 after the original tower collapsed without warning in 1902. The present campanile was rebuilt exactly like the original with the addition of internal reinforcements intended to prevent future collapse. It was inaugurated exactly 1,000 years after the date that the foundation of the original tower is said to have been laid. It is possible to ride an elevator to the top of the tower. Sadly, we did not have time to do that, but I hear that the view from the top is incredible–Venice and the lagoon, as well as the Alps in the distance. The two columns situated near the waterfront in Piazzetta San Marco—just beyond St. Mark’s Square—are topped with symbols of the city. The winged lion of St. Mark and the city’s first patron, St. Theodore, with his dragon tower high above the landscape. Apparently, the Republic executed convicted criminals between the two columns in days gone by. It is said that, to this day, superstitious Venetians avoid walking between the pair of columns. The platforms located outside St. Mark’s Cathedral are used when the water rises in the square. They are laid out end-to-end and provide an elevated walkway. Thankfully, there was no flooding while we were there! For a little extra cash, you can grab a seat at one of the outdoor cafes in the square and order something to eat or drink while you watch the passersby. Or, like us, you can opt for a cup of coffee and a bite to eat from the American Snack Bar and do your people-watching standing up! Either way, St. Mark’s Square is a must-see stop on your Venice travel agenda.